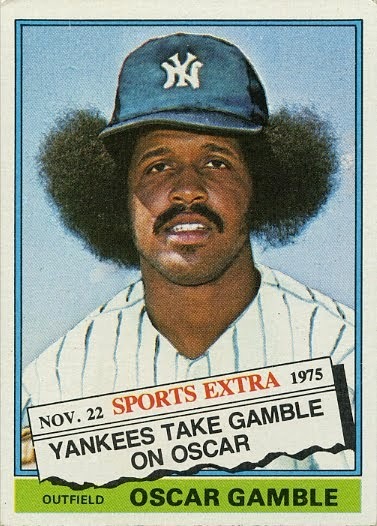 One of the packages I received last week included a sweet batch of Oscar Gamble cards. I've been passively....VERY passively building an Oscar Gamble pc. After choosing my 76 Topps card as my #WalletCard for the year, it seemed like a logical choice. But this is all about fun - FUN!! I've seen dozens of Gamble cards on ebay over the past few months but have been rarely active in buying any. Most of his cards (about 150 or so) are on the low end of the $$$ scale...which is absolutely fine by me. What it does do though is make me less interested in buying them online. Instead, I'd rather pick them up locally or through trade. I also did grab a couple cards that I thought would fit in the "tougher to find" category. When all the cards arrived, they were packaged up and sent my way. Now I'm not going to scan each and every one of the penny base cards, but I will share my favorite. This 1984 Topps card has a lot going for it in my eyes. First off, I love the classic, horrible centering job. It's so bad....it's good. The card has great surface sheen and strong corners, Topps just couldn't get that darn photo in the middle of the off-white rectangle. I like this card for the flashback memory it gave me since I collected baseball cards in the early 80's - and I remember buying packs of 1984 (it was OPC though since I live in Canada). 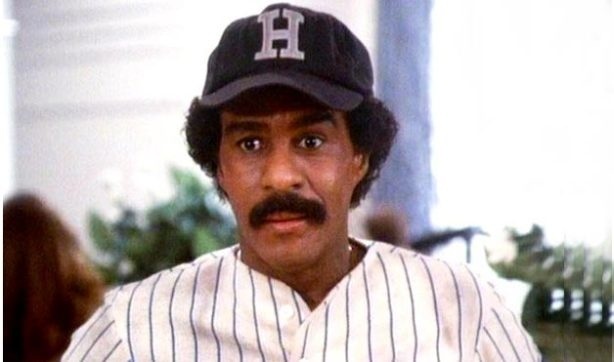 Lastly, is it me or is that a dead ringer for Richard Pryor circa Brewster's Millions? As for the rarest card to cross my deck, it was one that I absolutely hate the concept of and upon closer look think it's a complete laugh. This cut signature card put out by Tristar reeks of horrible. It's a cut auto of a guy who's living. 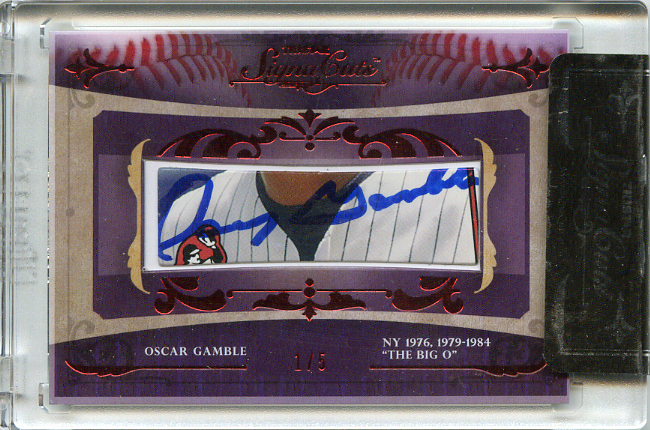 It's a cut auto from some existing photo (I hate those....especially when said signer is still alive). And the signature doesn't fit in the window. Upon closer look, the auto isn't even placed in the background of the top die-cut layer. It's like a puzzle piece cut and then placed into the window. But hey....it's /5 so that makes it a super-rare and desirable piece right? WRONG. It was a cheapie on COMC that I made an offer on as opposed to flat out buying. In the end, it cost me a little over $10. And I'm pretty sure that the product it comes from is more than a $10 product. Overall, I'm happy to add these (and all the other cards into my collection. It feels nice to make some progress. This card is in serious consideration for the bike spokes. 1. 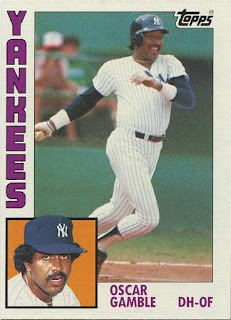 That is a classic 80s card look. 3. How little did Topps really care about card making when that is the head shot they used in the bottom left? 4. That auto is pretty bad.